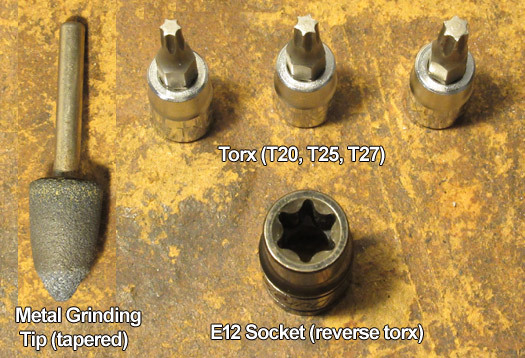 E13 (if available) or E14 socket. 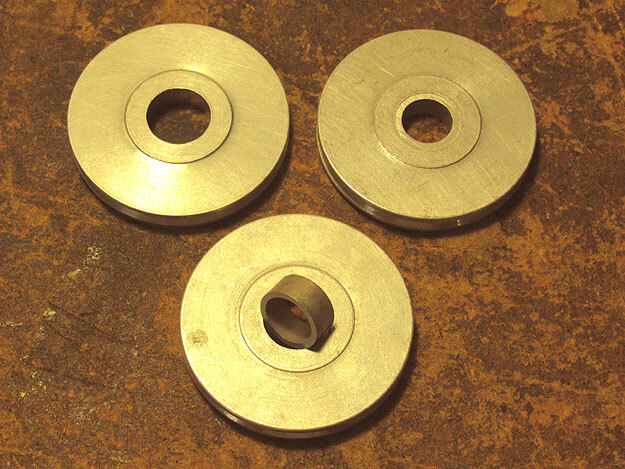 (1-4) Metal pulley wheels: contact: cspassoc@outlook.com, price: $20 each ($15 each for 3 or more), shipping: $16. Prices subject to change. Removable bushing for use with different axis sizes. Rubber window bumpers: p/n 51 33 8 257 714, package price: $6.84 (list). 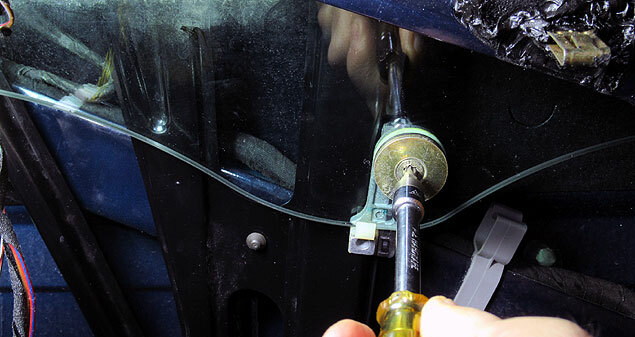 Replacing failed BMW window regulators is a job no one likes to deal with. What makes it worse is that many DIYs on this subject are incomplete or leave out important details. For example, the Bentley service manual incorrectly states the window glass does not need to be removed in order to extract the regulator! It's especially problematic if your window gets stuck in the closed (up) position. This blocks access to the regulator mounting bolts, and is an issue not addressed in service manuals or otherwise helpful YouTube videos. If this occurs on a rear window, verify that someone hasn't engaged the child lock switch before proceeding. (Doh!) See this thread for a helpful tip if your window is stuck closed. On the other hand, if your window is stuck fully open (down), regulator removal is not impaired. Regulator failure is caused by broken pulley wheels. These pink-colored wheels guide the cable around the regulator frame. Front windows have 4 pulleys (2 upper, 2 lower) while rear windows have 2 pulleys (1 upper, 1 lower). In my admittedly limited experience, the upper pulleys are the problem. Why? Because the taught cable joins the upper pulley at an angle offset from its plane, causing it to bend and break over time. By contrast, cable forces on the lower pulley are mostly inline with its plane. On the regulator shown in panel A below, the upper pulley is completely broken away from its axis post, while the bottom pulley (panel B) is in good condition. Additionally, many regulators have failed bumper end-stops. 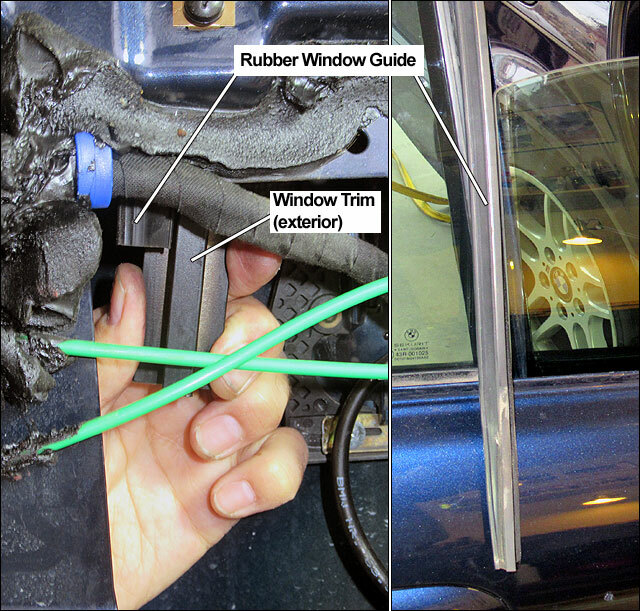 These rubber bumpers prevent the window from making a "clunk" sound when reaching the bottom of its travel. They are easily replaceable. In panel B above, note the broken and failing bumper (left of pulley). In some cases, the bumper may be missing entirely. After pulley failure, continued operation of the window will cause the loose cable to get crossed in the cable spool. This results in terrible crunch and crackle noises as the motor operates. (This is not the sound of the motor "chewing up" the cable.) These noises alone would be enough to motivate people to replace the entire regulator. Electric window motors rarely fail. If they do, it may be due to fouled contacts. 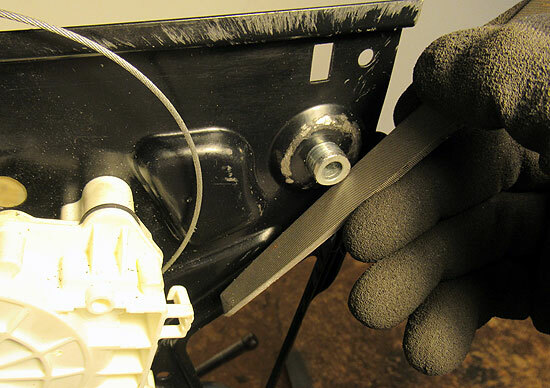 See Window Motor Repair for instructions. Cable spools on E38 7-series are considered part of the motor, while spools on the E39 5-series are separate. This is probably why motors are available as a separate part only for the E39, while requiring a complete new regulator for the E38. Replacement BMW regulators cost upwards of $300 each and come with the same failure-prone upper pulley wheels. Cheap, aftermarket (eBay) regulators can be worse, with their pulleys typically lasting half as long. And with 4 windows, there's lots of opportunity for problems. Thankfully, it is possible to replace your broken pulley wheels with stronger metal pulleys. Just as important, it's possible to rectify a crossed cable spool. By finishing with new bumper end-stops, you can effectively rebuild your entire regulator! Compared to the cost of a full service repair, this can save you well over $500...and last longer! 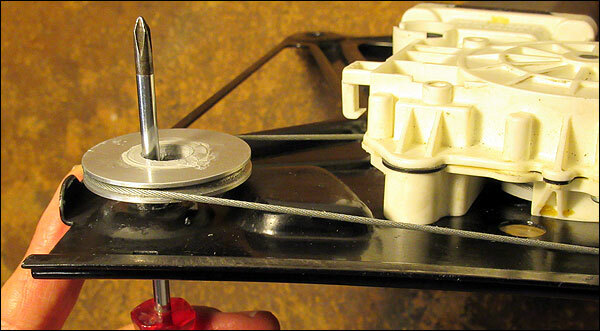 For reasons cited above, this DIY focuses exclusively on upper pulley replacement. If your lower pulley has failed, the replacement procedure is quite different. I offer a few suggestions in the Procedure section below. 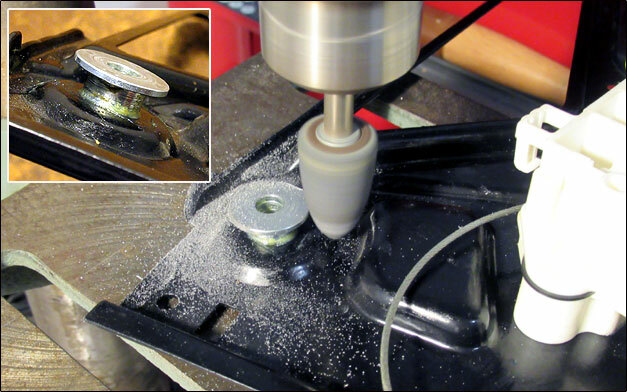 Use a drill press with a tapered grinding tip to access the entire circumference of the flange without interfering with the black regulator frame. 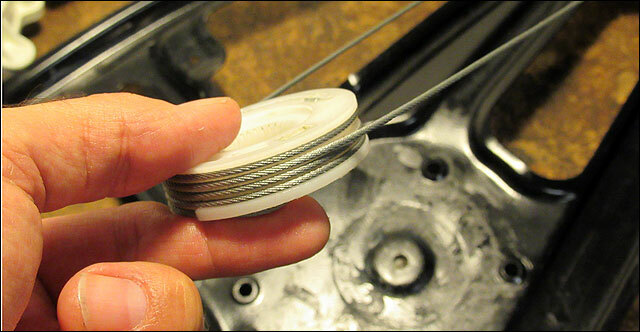 A washer will replace the flange and act as a spacer. Once the regulator is re-installed, the new metal pulley will be retained after being sandwiched between the regulator frame and the post's upper mounting point inside the door cavity. This DIY assumes your window is still functional. If otherwise, special instructions will be noted. The right rear door of a 2001 740i is the subject of this procedure. Performing this task without damaging the panel may be the most difficult part of this procedure. It may be a good idea to have spare door clips on hand (to replace the broken ones). 2) Remove black vapor barrier. 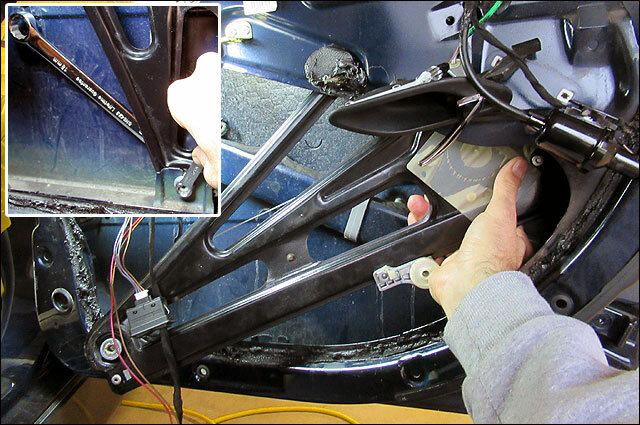 Begin by unplugging and removing door speaker box. Then, remove lock actuator mounting bracket. See image below. Free the door wiring harness by snipping the cable ties securing it to the two fastners. This reveals the plastic rivets securing the fastners to the door. Pry out and remove the rivets to release the fastners. 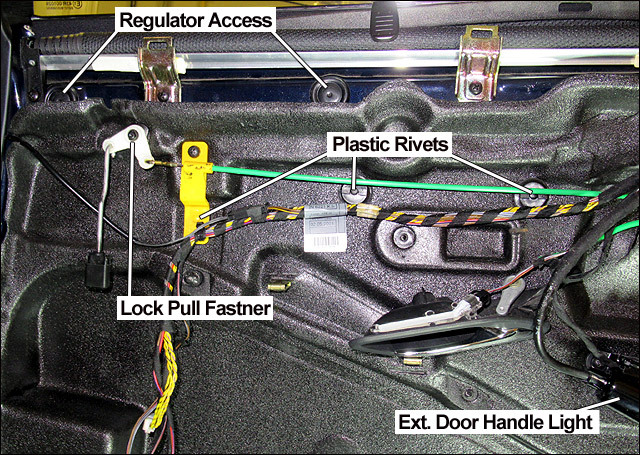 Then pry out the yellow rivet holding the door lock cable, and release its screw. Do not attempt to remove the lock pull lever. It's plastic fastner (screw) is brittle with age and is liable to break (ask me how I know). Instead, leave it in place and use scissors to cut open the vapor barrier surrounding its mount point. Finally, pull out regulator access plugs. With impediments free, begin pulling vapor barrier from upper outer corner while also working lower inside corner. Try to keep the black goo off your hands. 3) Remove exterior, quarter window trim strip. With interior quarter window trim removed (or quarter window shade), release the three now-visible screws to release exterior trim. Raise window. Reach up inside door cavity and grab end of exterior trim. Pull strongly downward to remove. 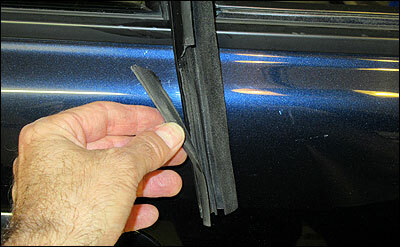 Be careful not to grab rubber window guide along with trim, as they are located together. See image below, left. For non-functional, open windows: Using rubber gloves for extra grip, apply strong downward pressure to exterior trim. It should begin to slowly move down. Continue pressing downward until trim is about halfway down. Now, pull strongly upward on trim while pulling outward to remove. With exterior trim strip removed, pull up on loose rubber window guide until it clears the door. See image above, right. 4) Lower window halfway. Remove window retaining bolt using T25 torx (image below). Remove window. For non-functional, closed windows: Access retaining bolt thru upper door opening. Pull gently upward on window while working it toward the outside of door, toward loose window guide. If window is stuck closed (up), be sure to read specified forum thread in Getting Started above. Set window aside in a safe place! 5) Unplug window motor by reaching up inside door cavity. 6) Using an E13 or E14 socket, release the two upper regulator mounting screws (thru door access holes). Then, remove the lower regulator mounting bolt using 10mm box wrench while counter-holding opposing nut with 18mm wrench. See image below, inset. Extract regulator from door cavity; move to work bench. See main image above. 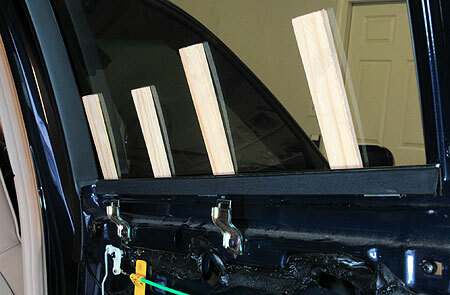 TIP: In order to keep your car drivable while performing this procedure, use common wood shims inserted between the inner seal and glass to hold the window closed. It may look strange but believe me, your window won't budge! We have finally arrived at our objective. You can see why this job is such a PITA. 7) Inspect regulator for failed pulley(s) and rubber bump-stops. It's likely you will find the lower pulley(s) functional while the upper(s) have failed. Therefore, this DIY focuses exclusively on the upper pulley, with supplemental suggestions for the lowers. 8) As discussed in Getting Started above, prepare upper pulley mounting location by grinding away the flanged end of the axis post. It's not necessary to grind flange until it exactly matches the diameter of the post. Some "slop" is okay. Lower Pulley Mount Suggestion: Drill out lower pulley axis hardware. Use bushings from two metal pulleys to slide over a bolt/nut combo thru the regulator frame. The pulley should not be pinched between the frame and nut! Use 7/16 washers for spacers as needed. This combo will need to remain loose until regulator is secured to its lower mount. 9) Remove window motor and cable spool. This requires patience and concentration to complete, and may take several trial-and-error attempts. Be sure spool is oriented correctly to receive the motor drive. 11) Re-attach spool to motor drive, then secure motor drive to regulator frame. To take up cable slack, loop cable over upper pulley post and position spool back into motor drive. (Or, ask a helper to keep cable taught.) Verify cables exit motor drive thru the correct slots. Then, secure motor drive to regulator frame. 12) Now slide new metal pulley onto upper axis post. 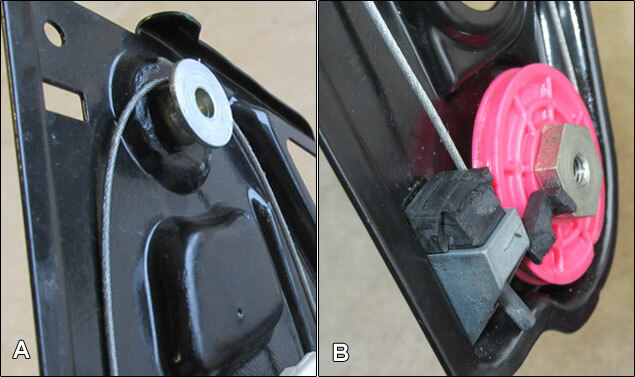 In main image above, it should be clear why upper pulleys fail: the cable is not aligned with the plane of the pulley. This results in a constant bending force on the pulley. Since the cable is quite taught, this force must be considerable. However, the same arch of the upper regulator frame which results in this pulley-to-cable misalignment works to hold the new pulley on its axis post without an additional retainer -- for now. When the regulator is installed, the end of the post adjoins a bracket inside the door cavity, effectively closing it off. 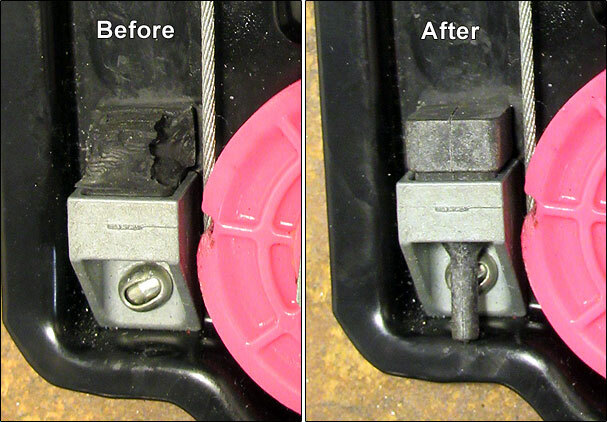 15) Congratulations: you successfully rebuilt your window regulator! Before installing the rebuilt regulator, test it. Position it close to the door and plug in the motor. Run the regulator fully up and down. Listen for cable crossing in the spool. It should run smoothly and quietly. Don't forget to install the 7/16 washer on end of pulley axis post before regulator installation. 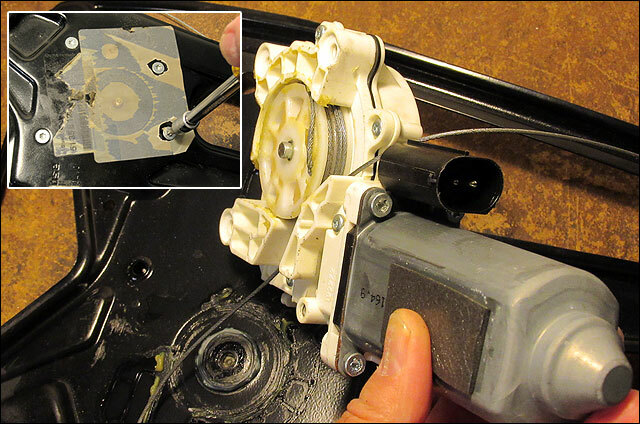 To prevent the loose washer from falling off while regulator is positioned inside the door cavity, apply a generous amount of lithium grease (or similar) between it and the pulley (as suggested in step 13 above). Now use your window with confidence!